Just days ago, Rhode Island Gov. Gina Raimondo has released a $9.9 billion state budget. With the release of this budget proposal the Rhode Island General Assembly will begin work to hammer out its plan before the 2020 fiscal year begins on July 1. 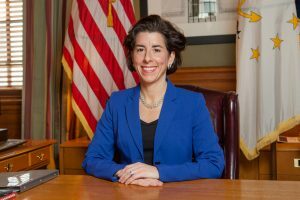 Raimondo’s released budget plan is $357 million, or 3.7 percent higher than the fiscal 2019 budget. Here’s a sampling of how this proposed FY 2020 Budget impacts programs and services for older Rhode Islanders and to providers delivering care. The Raimondo FY 2020 budget recommends the transfer of the state’s Division of Elderly Affairs (DEA) to the Executive Office of Health and Human Services and renames the division to the Office of Elder Affairs. The Governor shifts financing for the office and 31.0 FTE positions to EOHHS to accomplish this recommended action. Years ago, aging advocates fought a losing battle to keep DEA an independent agency that had direct access to the Governor. Will the state’s aging organizations view this bureaucratic realignment positively, as a way to elevate its function and more closely align its work with the secretariat. We’ll see. Raimondo continues her efforts to keep older Rhode Islanders in their homes and out of nursing facilities. The FY 2020 budget expands the state’s Home and Community Care Co-Pay Programs, allocating $ 550,000 to expand access to eligible seniors to enable them to stay in their homes longer. The Governor recommends expanding eligibility for the Elderly Affairs co-pay program, increasing the maximum income limit for eligibility from 200 percent of the Federal Poverty Level to 250 percent of the Federal Poverty Level. This program provides subsidized home care and adult day care for seniors not eligible for Medicaid, keeping those adults healthier longer, and reducing enrollment in more expensive residential treatment programs. The newly released FY 2020 Budget also increases Health Facilities regulation staffing. The Governor recommends a $327,383 increase in restricted receipt funds for 3.0 FTE positions. These positions will bolster existing staffing to increase the number of inspections to state-licensed healthcare facilities. Funding is made available through one-time settlement funds from fines levied on healthcare facilities. Combined with federal funds, the Governor’s recommended budget will provide total funding for health facility regulation of $5.5 million. Recognizing the importance of the state’s Elderly Transportation Program to keep older Rhode Islander’s independent, Raimondo recommends additional resources of $1.8 million above the FY 2019 enacted level from general revenue to support the State’s elderly transportation program. This program provides non-emergency transportation benefits to Rhode Island residents aged 60 and older who do not have access to any means of transportation. The program provides transportation to and from medical appointments, adult day care, meal sites, dialysis/cancer treatment and the Insight Program. The Governor’s FY 2020 budget also through the Rhode Island Public Transit Authority continues to subsidize the transit of elderly and disabled Rhode Islanders through the Rhode Island Public Transit Authority. Raimondo’s budget plan seeks to freeze the state’s Medicaid payment rates to hospitals, slashing funding by an estimated $15 million overall for the year, and to limit the rate increase for nursing homes to 1%, costing them nursing home providers about $4 million. The Governor continues her support for the Independent Provider model P model with almost $200,000 in general revenue funds (about $770,000 all funds) to cover implementation costs. The goal of this model is to increase workforce capacity and create a new option for delivery of direct support services for both seniors and people with developmental disabilities. For more details about Raimondo’s FY 2020 budget go to www.omb.ri.gov/budget/prioryear/operating/2020.php.